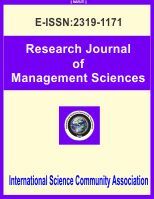 International Science Community Association are publishing an international peer reviewed journal Research Journal of Management Sciences. It is the vision of International Science Community Association to publish research papers, research articles, review papers, mini review, case study and short commutations in all areas of human study without financial restriction. Coverage Area: Researches in the field of management such as business, management principles, recent inventions in management, company management, financial management, marketing, accounting, operations management, organizational development, international business, corporation administration, human resource management information technology, environment, risk management, globalization and related areas.